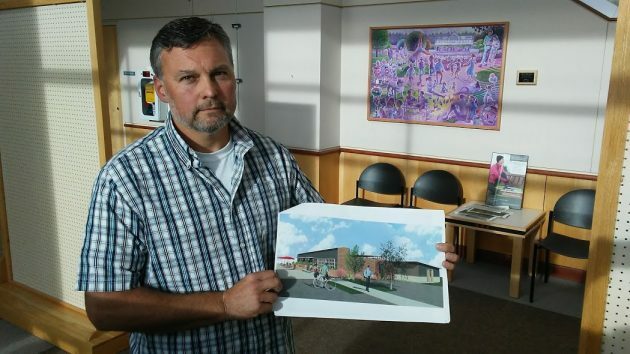 Calvin Bontrager with an image of what he’d like the outside of the “Albany Garage” to look like. The one-story building at the southeast corner of Water Avenue and Hill Street doesn’t look like much. But it could become an attraction on the Albany riverfront if a contractor carries through with a concept he showed the downtown urban renewal board last week. Calvin Bontrager owns the general contracting company called JDR for “Just Done Right.” He is leasing and intends to acquire the former garage at 135 and 139 Hill St. N.E., which county tax records say was built in 1940. Inside the remodeled building, Bontrager envisions a large open space with seating and a see-through fireplace surrounded by four shops for artisans (he mentioned a glass blower), a couple of offices, an indoor food truck, two offices, a public restroom, and space for an all-year farmers’ market. He showed the CARA board drawings and illustrations done by Albany architect Don Johnson. One hurdle is parking. What parking is available in the area is usually taken up by customers of the Calapooia Brewing Co. across Hill Street. But there’s an unused parcel of city-owned land in the middle of the Edgewater Village development across Water Street. 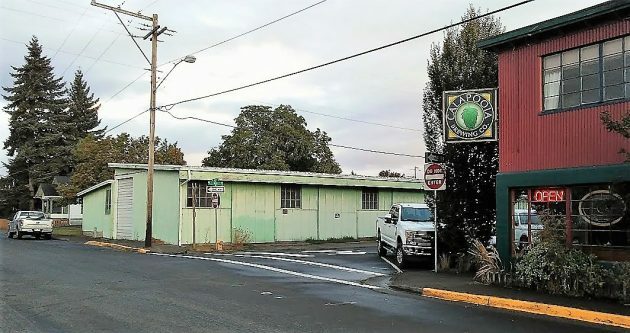 The city obtained the land several years ago as part of a franchise agreement from the BNSF railroad, and Bontrager now hopes the site will become a parking lot. Not having parking available, he told the CARA board, would be a “deal breaker” for him. The story has been edited to use the proper term for that Seattle market. Thanks to the commenters below who had a fit because the original mistakenly added an apostrophe and s to the name. The old garage is across Hill Street from the Calapooia Brewing Co., a popular restaurant. Terrific idea however, the building that you speak of is Lepman Properties and is full of maintenance equipment, work space, etc. I would imagine they’d have to move in order for the Albany Garage to set up shop. “Little Pike Place” … Micro Pike maybe. Description sounds nothing like Pike Place Market to me but hey. Hope the indoor food truck vents outside. I also hope for a follow up story HH. Maybe close ups of all the artist renderings. Yes, A++ for idea & vision! Next we will need a short run train down Water Street between the ‘Albany Garage’ and the carousel and Monteith Park to make it destination. Light Rail service with stops in Jefferson, Stayton and Salem. I am so hoping Mr. Bontrager gets to fulfill his vision! This would be such a great addition to the enhancement of the area!! Another way to revitalize! Nice idea, but it’s Pike Place Market. Pike Place. There is no apostrophe. Pike street ends at 1st Avenue, and turns into Pike Place. The Farmers Market is on the street named Pike Place. There is no Mr. Pike. It’s PIKE Place, goddammit, not PIKE’S. Is this proposed Pike’s Place in anyway related to the Colorado Pike’s Peak? How loud would the screams be if the City gave up property so 2 businesses could have parking……….. HJ, James, Howling, HH, ????? I think you could hear the screams from Salem, Now if we SOLD it so others could make parking…….. that is another story, there would still be screaming, but then I would agree with doing it. Might be worth remembering that the city government did not buy this property. It was more a case of extortion — the property in return for a franchise agreement. since when did that ever stop government from doing anything???????? My point was that since the city government has nothing invested in this property, it might want to keep making it available for public parking. a. Emphasize the use and improvement of natural drainageways. Wouldn’t putting gravel down be the ultimate in use of “natural drainageways”? Christ….. if I knew you …surely I would think differently but you seem to be the definition of a curmudgeon! You know! The ultimate naysayer ….always banging on the fail point. You really should have some vision yourself. Forward vision that is! Better yet, you need a seat challenger! Thanks for addressing several of us in your comment btw. Keep it civil, love this idea of a market. We’re doing good as a community, lots of upward momentum. Knife River – 10 yards 3/4 gravel $267, Albany Rental $100 for a Bobcat spreader, we can make things happen as a community, don’t have to spend a million dollars everytime we want to get something done. Sounds pretty good as long as the city doesn’t mess it up with taxpayer subsidies. Let the free enterprise system decide what works. Can we step back a minute and take a broader look at parking? Electric power costs money to generate and deliver. Customers pay for the amount used, in fact at a higher unit price when using more because adding new capacity is very expensive. If my landlord or city government included the cost of power in my rent or tax, I might be inclined to either waste it or feel resentful toward others wasting it – clearly a perverse incentive. Why should parking be any different? Parking space costs money to build and maintain, including the cost of land and the opportunity cost of not putting it to better use – doesn’t matter if it’s a garage, a lot, or on-the-street. Likewise, there is a very high incremental cost if you need to widen streets or tear down buildings. Free parking is an extortion racket similar to credit cards – the customer gets something “free” for which the merchant pays and in turn raises prices to everyone whether or not they use the service (cheers to Winco for not accepting credit cards). Free parking creates a perverse incentive by encouraging car use and discouraging alternatives, thereby increasing congestion, pollution, degradation of urban ambience, and demands for exorbitant infrastructure expansion in a vicious circle. When parking isn’t free, then private enterprise can take the opportunity to make a profit, or city government can have a revenue source to fix crumbling roads, or both. Wonderful, new ideas to enhance urbanity, like Bontrager’s, become more feasible when parking is sustainably outsourced. The right way to charge for parking is the congestion-pricing model, which results in parking being quick and easy to find almost any time and a reduction in road congestion. Better living through smart economics. Are you suggesting they put the parking meters back in? The meters that Albany tore out in the 1970s in a futile attempt to help downtown compete against outfits with big parking lots out on the highways? DictatorCicada says outlaw free parking in all commercial areas and work with residential neighbors to prevent fee avoiders from parking in residential areas. If government can, for reasons arguably either beneficial or bogus, force stores to charge for paper bags, why shouldn’t it be able to apply similar rules to parking? The answer to your question then is obviously yes. Back in 2017 Albany, the answer is probably no. Much more to say but out of oomph. We are talking about bike parking, right? I like the idea but it is a really small space for a public market. As phase II of Edgewater proceeds that whole area will be improved and the city parcel across from the Calapooia suddenly becomes more valuable.